Street photography is space enclosed in a frame. Looking at a photograph limits the viewer’s sense of space. Length is always determined by that unseen yet knowable vanishing point. This might be the limit of looking at a hanged photograph, but not of an exhibit. The curator’s deconstruction of space foregrounds the intersection of vanishing points—or its dissolution. He brings the city and its noise inside the exhibition area by constructing a street at the center of the UPV Art Gallery and hanging a traffic light just above it. The real street vendors Robert, Kenneth, and Nanette, bring their peanuts, chicharon, and banana cues inside the gallery for the viewers to eat; Tonyo has his ice cream cart just outside the entrance (the only difference is that the food are already paid even before they were “sold”). A scripted squabble between street walkers even prompts the appearance of a policeman and his whistle. The viewers who are suppose to concentrate on the photographs are made to look at the “street people” and eat the food that some of them peddle. The viewers become street people themselves. The space that divide the gallery and the street is vanished. The viewers occupy the “in-between” spaces. They are both inside and outside the exhibition space. Gaze is a form of rationality. It is invented to interrogate. It is direct. It acts as both conscience and reason. It is devoid of spirituality. It functions solely to restore order in society. Used in photography, gaze could be considered as part of speech—a linguistic utterance. Quitag’s use of the human gaze is rather admirable in “Pabagay,” where a boy holds a bicycle tire while its wheel is repaired by two adults. It is direct, innocent yet meaningful. Here, the message is sent using the triangle principle in blocking—the boy is the apex, the fact that he holds the gaze. It is even amplified by the spray-painted name “Boy(et)” just behind him. The message is simple: boys play, adults work. Here, the idea of humaneness works. In Jurilla’s “Public Lunch 1” and “Public Lunch 2,” gaze is used as interrogator/non-interrogator. In “Public Lunch 1” there is a man looking directly at the viewer while he suspends his act of putting into his mouth a spoonful of rice; he sits lotus-like—no chair, no table—in a makeshift stall. The act of suspension suggests a disruption into his “ordinary” activity. Both gaze and pose serve as interrogator. “Public Lunch 2,” however, relocates the gaze from the viewer to an unknown object or subject left of the viewer. There is no element of surprise here but a contemplative pose that suggest a more spiritual signification. The old man is well-seated, having a chair and a table, but uses no eating utensils, and he is just a few inches from the store’s fold-up metal enclosure. Repetition and variation is used in these two photographs to convey movement (of the head) and difference (in the pose), the transfer of gaze from viewer to non-viewer, the physical from the spiritual essence of ordinary people’s povertiness and powerlessness. The incapability of the human subject to hold a gaze is resolved in Jurilla’s photograph by relocating the gaze into the Santo Niño (“Imahe”) and by Lerona’s into a commercial model’s face (“Napiyongan lang”). In “Imahe,” the human subjects (a baby and a man) are backgrounded and blurred, turned into the role of insignificants. The image of the Santo Niño Palaboy (with his wooden stick/cross and pouch) subsumed the narrative of “travel” from childhood to adulthood the two backgrounded/blurred figures are supposed to represent. What is physical-mundane now becomes a religio-spiritual quest for the human subjects. The commercial model’s gaze, on the other hand, is that of innocence and seductiveness. Although it is used as a subliminal means to entice the public to buy/subscribe to the advertising network’s cheaper rate, the presence of the sleeping woman vendor in front of the commercial model’s image suggests a mockery on the former’s economic helplessness. In Jurilla’s photographs (“Sikad at Night” and “Public Shadow 1”), the gaze is direct but not prominent. It is hidden behind shadows and grays. It is motivated but prohibited by its environment. Night is, indeed, the enemy of gaze. It marks its absence. Thus, further aggrevating the ordinary people’s insignificantness. 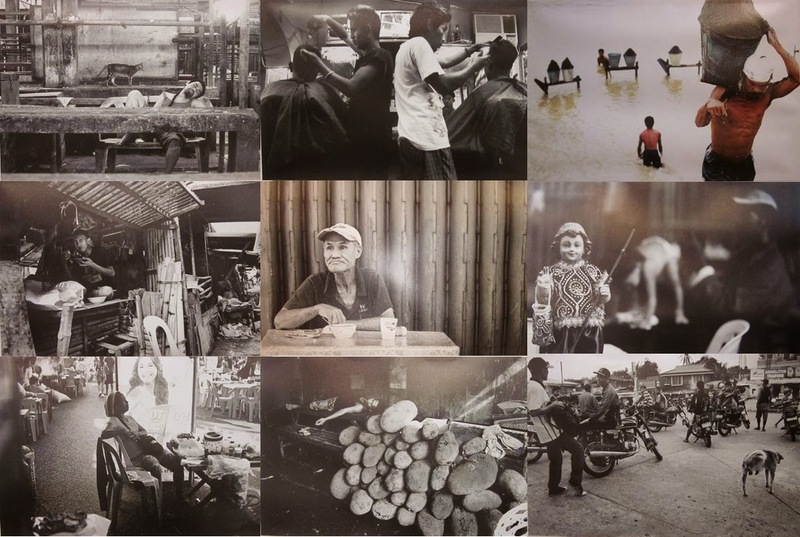 Ordinary people from the streets is the central subject of the photographic exhibit of these three Ilonggo photographers. Since ordinary people is perceived as speechless, the photographs are expected to speak for them. How do these photographs speak of the ordinary people depended on how the messages are conveyed on each and every photograph in the exhibit. Unlike painting and other visual arts, photography, according to Roland Barthes, is never art but always meaning. And it is in meanings that identities are constructed. Looking at Jurilla’s photographs one can never fail to notice that he takes shots from long distances and of few scattered (if not closed to each other) people of the streets. He has an idea of a street that is far more wider and bigger than the ordinary people. His “BFF,” “Ped Xing,” “Into the Dark,” and “Overshadow” are but examples of this kind of perception of street spaces. In “BFF,” two female students walk with a man beside the street while jeepneys pass by and the sun spreads its light; in “Ped Xing,” a girl, a boy, and a cargador walk fast the pedestrian while big buildings loam the landscape; in “Into the Dark,” an old man rides the bicycle amidst the wide expanse of the streets; and in “Overshadow” a God’s-eye-view of a store-helper carrying one and a half sack of rice crosses the street during the time of the day where one’s shadow could overshadow the size of the human body. Lerona on the other hand, sees the ordinary people of the streets in terms of their relationship to other objects. This relationship is determined by size and quantity of objects that occupy Lerona’s photographic frames. In “Sa Kasanag, sa Kadulom” the sleeping male subject and the working female subject is divided by the vertical line serving as edge of a store that separates the darker and the lighter sides of the public market, while in “Pahuway,” the sleeping man is surrounded by signs that shout their products and services mostly in capital letters. Similarly, “Kaupod” and “Bolantero sang Lab-as” both drown their human subjects by the sheer quantity of vegetables, fish, and other market goods. While in “Tinangkas nga langka” the sleeping subject’s size is overwhelmed by the sheer quantity of jackfruits just above his head. In “Sa parkingan sang single,” the drivers have no match to the number of motorcycles parked, and the boy in “Panag-ub” is but one compared to the many containers that he has to fill with water. If Jurilla’s concept of a streeet is vacant and vast, and people are but specks, Lerona’s concept of it is that it is full of objects, and ordinary people are but its other—its insignificant other. In Lerona’s, material things far outweigh (both in size and quantity) human significances. Ordinary people, to be represented, has to be in the presence of these objects. In “Tinangkas...” equations such as “a jackfruit = food,” and “jackfruits = money” are first established before the equations “man = eater” and “sleeping man = laziness.” Put together, what we get is this message: money is just here but (this) man is lazy to get it. Quitag on the other hand, has tried to look for balance between his subject(s), objects, and street spaces. His “Mapiyong-piyong ko anay” is dialogic as it attempts to narrativize the story of a sleeping man and that of a curious cat (at first glance, the cat seems interestingly looking at the man). This dialogue is further enhanced by a series of receding frames of the meat section of the public market. In “Pagwapo,” the two barbers with their backs on each other and wearing shirts with contrasting colors is a composition that tries to negotiate equal amount of space and compositional opportunities. The idea of space-sharing is what Quitag tries to explore in “Idog-idog da abi anay” by using jeepney ride as metaphor for economic equality. And in “Pabulig hakwat,” he uses Oriental occult balance to highlight the muscular intensity and body density of the sand gatherer vis-a-vis the other workers—a rather heroic portrayal of ordinary people. By representing the ordinary people in photographs as subjects smaller than the world of the streets and as objects’ insignificant other(s), what Jurilla and Lerona have achieved is to mark their innocentedness, thereby creating a “distance” between meaning and image. In their photographs, instead of making them speak, the ordinary people were drowned into the vastness of street’s spaces and abundance of objects. Some of Quitag’s photographs may have attempted to balance spaces for his subject(s) and his/their environment but still convey innocentedness. Photographs are not innocent representation of realities. Camera tricks, the subject’s pose, gaze, and space are used to foreground meaning(s) behind each and every photographic images. Street photography is just that: images written in silences, ordinary people reduced to insignificantness. Street photography decenters rather than centers its subject(s).